Overnight stays in a private apartment are now available as part of the Hub Culture London Suite in Mayfair. 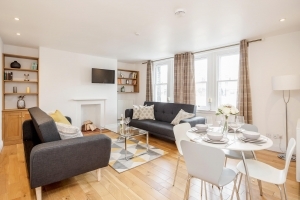 Set on the top floor of a beautiful townhouse in Shepherds Market, this one bedroom apartment provides members an expanded service connected to the Hub Culture London Suite. Suited for both solo travellers or bigger groups, the apartment is done to an extremely high standard and has a fully equipped kitchen, good size double bedroom (with LCD TV) and gorgeous living space. You can book directly by contacting Hub Culture Concierge Support to discuss a booking.